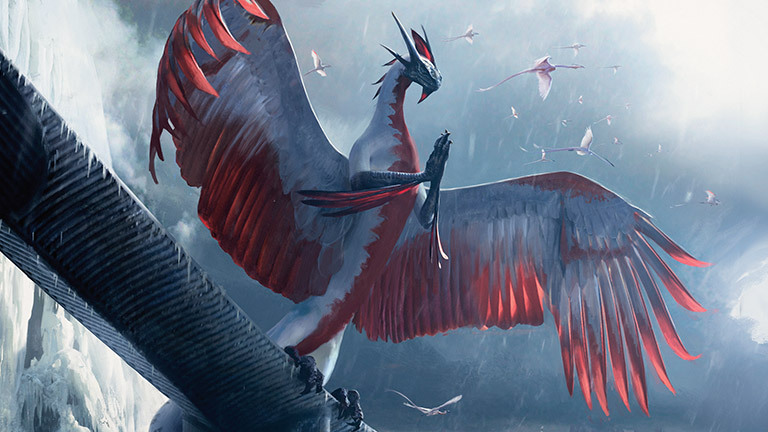 Speaking Casually: Take Flight With Esper Dragons. Hello everyone, and welcome back to The Arcane Sanctum. I hope you all have been well, and have enjoyed Dominaria so far. It’s nice to see a lot of excitement back in a Magic set release again, and levels of excitement like this make it a lot easier for players to try new cards in formats outside of Standard than they would otherwise. I personally can not wait to play with Teferi, Hero of Dominaria as he looks really powerful. As you may have noticed I changed the Spotlight section at the bottom of the page to showcase “The Card of the Month”, and for this month Teferi is it. It’s been awhile since a blue Planeswalker was sought after like Teferi is now. We have to go back a few years to when we had Jace, Vryn’s Prodigy legal in Standard. When I think about that card my thoughts go to a deck he played a prominent role in: Esper Dragons. For those of you new here to the site this article series titled “Speaking Casually” takes a look at decks from Standard’s past. I have played a ton of Standard (up to the release of Battle For Zendikar when my focus switched to Modern, Legacy, and soon after EDH). If you were not around for these decks when they were in Standard then that’s ok. I hope you enjoy the look back on some of the powerful things we used to do, and hopefully that will pique your interest in some of these cards that have left us. The purpose of this series is to also give more ideas to players for whatever level of play they are at currently whether it’s at the kitchen table, or even at FNM. In recent years Wizards of the Coast has stated that their goal for Standard is for people to take their decks when they rotate, and go play them in Modern with a few changes (usually lands, a few creatures or spells, etc). We’ll go over some possible changes that can be done here at the end of the article, but for now let’s dig in to a sweet deck. Unlike traditional draw-go control decks this deck plays more of a “Protect the King/Queen” style of deck where you land one threat, and protect it with your spells. Not only does Ojutai deal a lot of damage, but it also finds you more cards to protect your threats from removal spells your opponents will be playing. Silumgar on the other hand likes to take things your opponent has already played to use on your side. One common thing Silumgar has done is take an opposing Planeswalker, use that walker’s ultimate, and remain on the board. That’s pretty strong for 6 mana. That’s not the only way these Dragons matter. They also improve the spells in your hand. Silumgar’s Scorn turns into Counterspell (YEAH! ), and Foul-Tongue Invocation helps you stay alive by gaining life as the opponent sacrifices a creature. These spells work this way both early, and late, as long as you have a Dragon in hand or on the battlefield. Remember earlier when I spoke about this Jace being the last blue Planeswalker in Standard that saw a lot of play. Well here in this deck he’s able to replay a lot of key spells from your graveyard in the critical part of the mid-game where you need to turn the corner. He can also help power down potential opposing attackers, and once you get his emblem going every spell you cast reduces the resources your opponent’s can get. Very powerful indeed. Along with powerful spells in Dig Through Time, as well as spot removal like Ultimate Price, you can fend off a lot from your opponent before casting a large Dragon to help guide you to victory. The mana base is also smooth, however keep an eye on your white resources as those feel like they are in limited supply here due to the needs of both blue and black. Your sideboard is filled with cards that can disrupt the opponent’s plan from targeted discard, to life gain, and even more card draw for the mirror match. Sadly Dig Through Time is not legal in Modern, and our options to have access to multiple cards is quite limited. If you’re on a budget running a pair of Jace’s Ingenuity in place of all 4 Dig Through Time would be reasonable as you are getting 3 cards at instant speed for only 3 mana. With some changes to the mana you could also run Sphinx’s Revelation, more Anticipates, or even Serum Visions. Earlier I mentioned how much Dragon cards matter. Back in the Lorwyn block (over 10 years ago now!!!) there were Tribal cards that would count as being a part of a certain tribe (Elves, Merfolk, etc). The Shapeshifter type meant these cards were of any creature type, and in this case will count as a Dragon when casting Silumgar’s Scorn! Now Orator of Ojutai may look odd, but people do play Wall of Omens, and if the deck is built with the right density of Dragons you could reliably draw a card off of this, while holding aggro at bay. Keep in mind taking this deck outside of Standard provides you access to many other Dragons, including Steel Dragon. With these large beasts you have a lot of mana untapped when they attack for the first time, so it would be ideal to use it wisely by taking out opponent’s permanents while dealing damage. Just watch out for removal spells though. This is just a taste of what you could do with the deck. Heck the mana base is nearly Modern viable missing only Shocklands from Ravnica, so make sure you work with the numbers to be able to cast all of your spells on time. You will also want to be mindful of your curve, and take out cards that you may never cast (looking at you Ugin), or even cutting back on the high end cards (3 Ojutai instead of 4 as an example). That’s all I have for today. What are your thoughts? What would you change, or have you already tried this and wish to share some stories? Please comment below. Thank you all very much for stopping by to read this. Please remember to like, and share with your friends. You can also follow me on Twitter & Facebook for more thoughts on Magic: the Gathering.